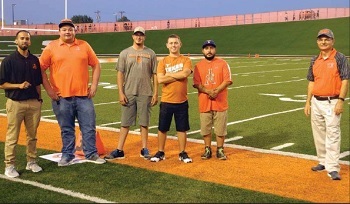 Above from left, Rusty Clack, Mike Currier and Max Ratliff pose for a picture Friday prior to the Bulldogs’ game against Alamogordo at Bulldog Bowl. 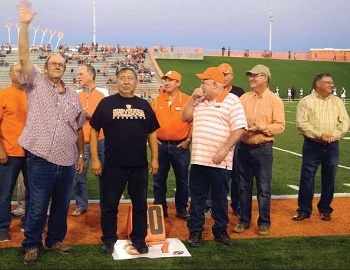 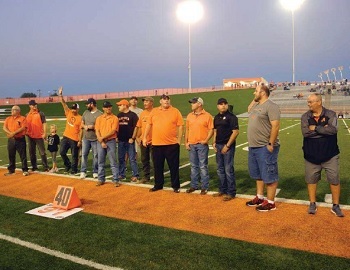 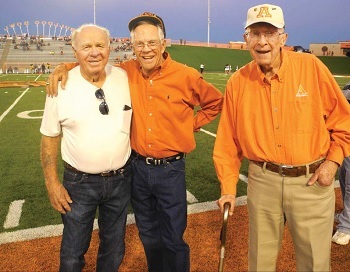 Clack, Currier and Hill Baker (not pictured), members of Artesia High School’s first state championship football team in 1957, and Ratliff , one of their coaches, participated in the coin flip prior to Friday’s contest and also represented their squad in a ceremony honoring the five Bulldog teams who brought home titles in years ending in seven. 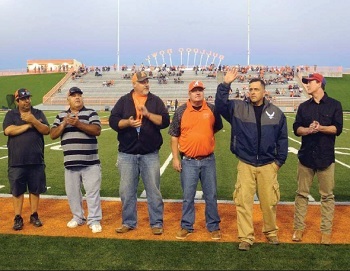 The athletes were presented with a special coin provided by Coach Vernon Asbill.